Tabletop gaming has been something I've only gotten deeper into with the last few years, while my video game hobby has been around since I could hold a controller. Since I started getting more into playing board games, I've been excited to see the two types of games blend together. There has been no better example of this concept than Hand of Fate. Taking some core concepts of tabletop gaming, like drawing cards for random chance encounters, and mixing them with video game concepts like real-time combat encounters, it worked surprisingly well. 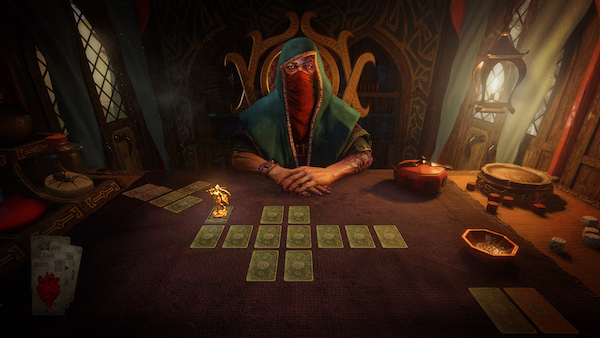 Hand of Fate 2 takes all of this and expands upon everything adding more elements and improving the overall structure of how the game is played to make for an even better blend. Leading directly off the heels of the original game, Hand of Fate 2 opens with you customizing a new character. 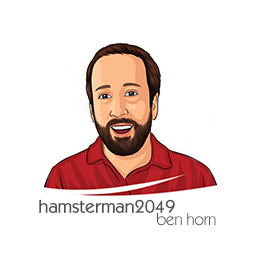 As you come face-to-face with the master of the game from the pervious entry, he informs you that his seat has been overthrown by the previous protagonist. Wearing new white robes, and looking a bit worse for wear, he floats out the familiar sets of cards and leads you on a short tutorial quest. You are then tasked with preparing for an assault against our previous hero by playing a new and improved version of the game. One of my favorite aspects of the previous games were the random chance encounters littered throughout the deck. In the first entry, these were solely decided by picking amongst a group of facedown cards and hoping to pick the success card hidden amongst them. 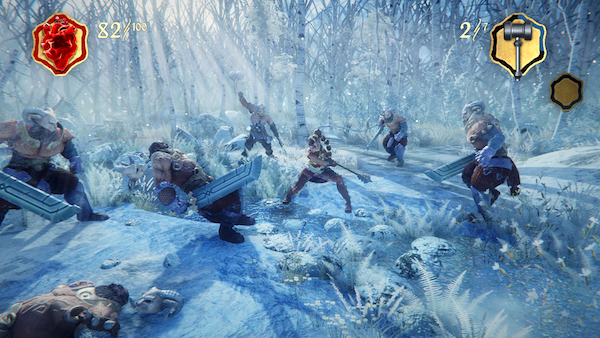 In Hand of Fate 2, this same chance encounter still exists, but it is joined by a bevy of new chance encounter types. One of these involves a beam of light moving back and forth across a plane. Simply stop it at the right time to succeed. This falls a bit more in the video game camp than the tabletop, but it is a welcome addition just the same. Rolling dice has never been my strong suit and it appears that the digital dice hate me just as much as the real ones. In the dice game, it gives you a number that must be exceeded by three dice. Often it will be ten or more and you only have the ability to re-roll any amount of dice once. There are some blessing cards that you can acquire that will either add to your total or allow for additional re-rolls, but this can be a tough one to pass. It usually feels about as fair as rolling real dice, but that doesn't bode well for my ability to get through it. 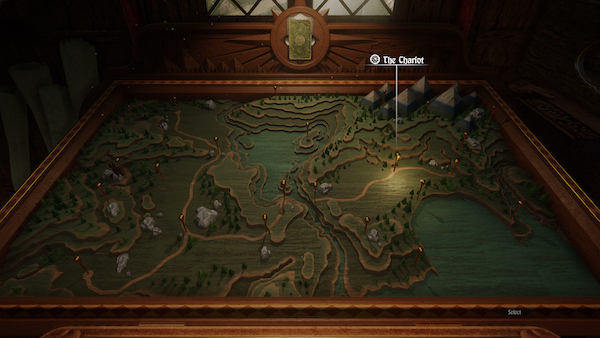 The overall structure of Hand of Fate 2 has been greatly improved from the original as well. 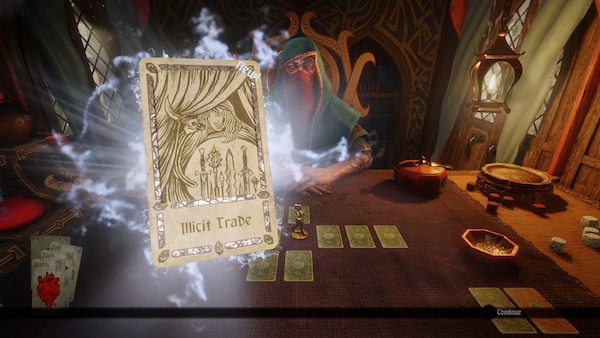 While every campaign in the first game felt pretty random, relying mostly on the cards you put into it, Hand of Fate 2 makes each campaign a self-contained story with its own set of special rules. In one level, you might be guiding a farmer that is constantly being kidnapped and another you're solving a murder mystery. Each campaign feels new and interesting and keeps the game feeling new every time you load up a new mission. Items and equipment were an important part of the first game, as you needed them make your character stronger. They have added a massive amount of new equipment and stats to Hand of Fate 2 which changes the game in some significant ways. One of the newest things to collect in the game is fame, which you can acquire through many of the new cards. This can affect things like special conditions for certain scenarios or even your ability to wield certain items. Only the most famous of heroes can handle the better items in the game, many of which are now represented by holographic cards, which scratches my trading card collector brain in a satisfying way. Trekking through the original game mostly alone, Hand of Fate 2 has also added companions to the mix. Your companions can aid you in battle and allow for a special attack. They can also have an effect on the scenarios, since there are some cards out there that require you to have brought a specific companion in order to complete them. I love the personality that the companions bring to the game and customizing your experience even further by bringing your favorite companion along is fun. Improving quite a bit upon an already great game, Hand of Fate 2 makes all of the right decisions when it comes to additional content. I would have been satisfied with simply more Hand of Fate, but Defiant Development really took the time to think about what could make Hand of Fate 2 worthy of being a full sequel and executed it as well as possible. If you enjoyed the first game, then I can wholeheartedly recommend Hand of Fate 2 to anyone out there. You can pick it up now for the PS4, Xbox One and PC. Promotional consideration provided by Stride PR.